Firewall. It protects you against network attacks. RegRun. Creates backups of your security information, configures your security settings for higher safety level, optimizes your Windows startup, detects known and unknown Trojans and spyware components and removes them. Antivirus. It protects your computer against viruses. We have designed RegRun Security Suite to be a very effective system, tailored to individual user needs. We offer four versions of RegRun Security Suite. The Gold version is recommended for maximum protection and security. The Professional version can be efficiently used by users with special skills and qualifications. The Standard version can only remove dangerous components. RegRun Platinum includes a Partizan rootkit detector and a remover. RegRun Platinum includes integrated UnHackMe software. UnHackMe is a powerful anti-rootkit software. Today a lot of Trojans/adware components use a rootkit technology to hide their files and registry keys. RegRun Platinum includes BootLog XP software. Boot Log XP is the best Windows boot analyzer. If you have Windows 95/98/Me you should use the Golden Edition. RegRun Gold includes an extraordinarily useful feature called Rescue. It backups the registry and system files and allows the user to quickly restore them. Rescue automates everyday backups and controls backup's used space according to an original smart algorithm. Registry Tracer monitors selected registry keys and informs you of changes. 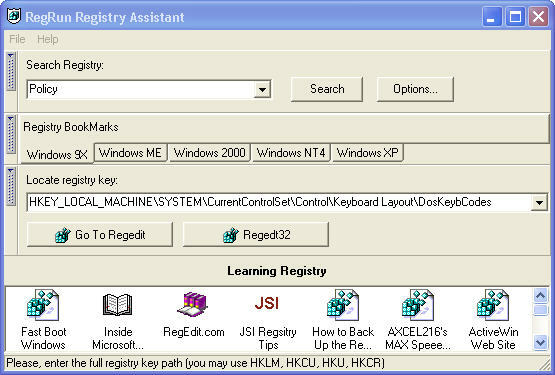 The Standard version allows tracing of only Windows startup registry keys. The Golden Edition configures Tracer for monitoring of important registry keys. 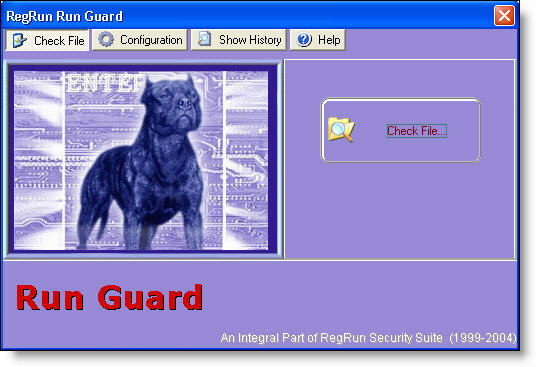 RunGuard controls execution of the scripts and the programs. 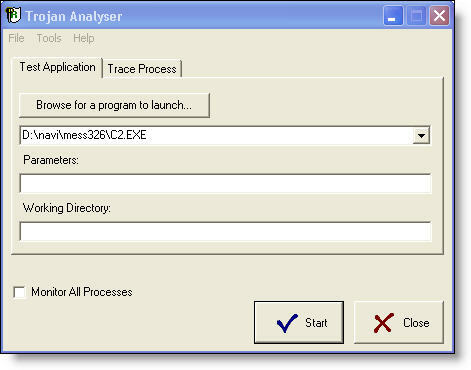 Trojan Analyser can investigate if a program is useful or if there is a possible Trojan. Startup and Bootlog Analyser can help to resolve the Windows startup problems. 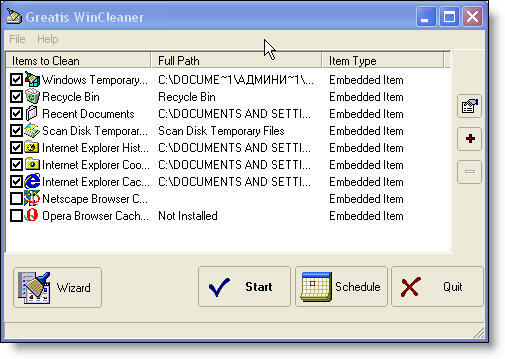 WinCleaner helps to clean temp files. RunJob allows you to launch several programs simultaneously, delayed, or consecutively: one after another, each waiting for completion of a previous program. Registry Assistant includes fast registry search and replace, tips and tricks collection, registry shortcuts, useful links and utilities. Registry Tracer monitors selected registry keys, and informs of changes. RegRun Rescue Creates backups of registry and system files and allows the user to quickly restore them. RegRun RunGuard Analyzes script files (VBS, JS), Microsoft Office files, registry files or HTML files before their execution. It warns you of suspicious or dangerous scripts, and offers the option of preventing execution. Unlike most of "script blocker" tools RunGuard works at the system level - assuring that it works even if the script has been initiated by a false extension, or is hidden within an email or a web page. Registry Tracer Registry Tracer monitors selected registry keys and informs you of changes. It allows you to reverse any modifications, additions, or deletions. RegRun Startup Analyser Startup Analyser allows you to unhide the Windows startup process. It is a must have tool for troubleshooting strange problems on the startup. RegRun Bootlog Analyser Bootlog Analyser allows you to troubleshoot Windows startup and shutdown using Windows generated startup log files. Trojan Analyser Monitors applications for suspicious behavior, including the registry, file activity, and reports if any questionable action is detected. RegRun WinCleaner Clears Internet cache, temporary files and other files assigned by the user. 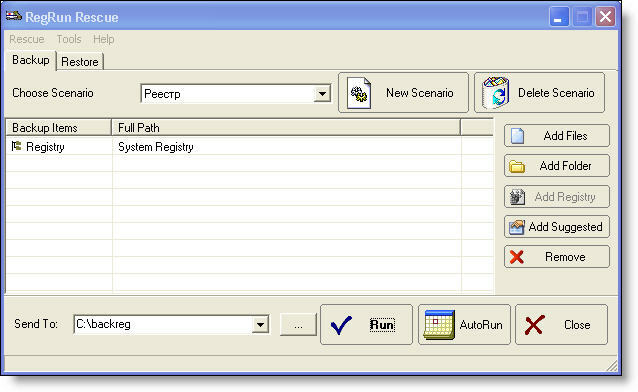 RegRun Run Job Advanced batch manager. It allows you to launch several programs simultaneously, delayed, or consecutively: one after another, each waiting for completion of a previous program. Registry Assistant Includes a registry search and a replace, tips and tricks collection, registry shortcuts, useful links and utilities. This includes a full, 32-bit application that allows fast, multi-threaded search of the Registry. It is a very useful tool for those accustomed to work with the Windows programs. Registry Tracer Registry Tracer monitors selected registry keys, and informs of changes. It allows you to reverse any modifications, additions or deletions. Detects rookits during Windows boot-up process. Removes hidden kernel rookits! Invisible Trojan's - Rootkits Killer. Provides an unusually friendly interface to those users, who can easily and quickly provide detailed information, suspend, resume, alter, or delete any of the programs within the Windows startup. Boot Log XP is the best Windows boot analyzer. Provides an unusually friendly interface to users, who can easily and quickly provide detailed information about, suspend, resume, alter, or delete any of the programs within the Windows startup. Protects Windows startup registry keys from changing. Startup Optimizer allows the removal of useless and dangerous applications from Windows startup with one click. Advanced Startup Optimizer allows to remove useless and dangerous applications from Active Setup items, Browser Helper Objects, Shell Loggers DLLs, Static VxD (Windows 9X/Me only). Analyzes the Windows registry, initialization files and .VXD. And warns the user of the changes occurred. Secure Start is activated BEFORE Windows startup - in both W9x and W2K/WXP. It allows you to reverse any modifications, additions or deletions. Monitors ports and applications that allow access to the Internet. �Clean Boot� allows the user to boot Windows without unnecessary or problematic programs and processes. This is a quick and handy alternative to Windows "Safe Mode". Provides a silent monitoring of the startup programs during the Windows working session. Watch Dog will pop up to inform you of any changes in these areas. It allows you to reverse any modifications, additions or deletions. System Files Protection is an extremely useful function serving to protect the computer from viruses, trojans and malfunctioning programs. It checks system files for adulteration and offers option to restore them if necessary. You have the option of attaching additional files for its protection. This is not signature scanning, but rather "infection scanning". During a session, it opens and monitors a number of "bait" program and macro files which are vulnerable to infection by any active virus. If any of these files change, it will advise you. Includes descriptions of always-used programs as well as malware. Watch Dog monitors applications as they start and compares them with the database looking for dangerous programs. Users may contact Greatis Software for any information about unknown programs. They can also add their own programs. Coordinator detects well-known antivirus programs (it can be customized to incorporate lesser-known AV programs) and uses this information to quickly check the startup files and folders, if necessary. Allows you to analyze and control all of the processes and modules on your computer. Looks like a Microsoft's SysEdit but it is handier and allows you to quickly and easily open your file subset. Allows a delayed launch of your programs. This is particularly useful for smaller systems that run many programs simultaneously at the boot up. Shows all the files that are open on your computer. Helps to manage Windows file extensions. Includes a registry search and replace, tips and tricks collection, registry shortcuts, useful links and utilities. It includes a full, 32-bit application that allows fast, multi-threaded searches of the Registry; a very useful tool for those who are accustomed to work with the Windows programs. Registry Tracer monitors selected registry keys and informs of changes. It allows you to reverse any modifications, additions or deletions. Advanced batch manager. Allows you to launch several programs simultaneously, delayed, or by "chain" - a series of jobs; each waiting for completion of a previous program. It allows to remove Adware from Winsock2 key in the Windows registry. It is a feature added to Trojans searching module. It fights against Trojans and viruses that have the same names with system files but locate in different places. Backups the registry and system files and allows the user to restore them quickly and easily. Analyzes script files (VBS, JS), Microsoft Office files, registry files or HTML files before their execution. It warns you of suspicious or dangerous scripts, and offers the option of preventing execution. Unlike most of "script blocker" tools RunGuard works at the system level - assuring that it works even if the script has been initiated by a false extension, or is hidden within an email or a web page. Monitors applications for suspicious be-havior, including registry and file activity, and reports if any questionable action is detected. Clears Internet cache, temporary files and other files assigned by teh user. Bootlog Analyser allows to troubleshoot Windows startup and shutdown using a generated by Windows startup log file (bootlog.txt). Startup Analyser allows to unhide the Windows startup process. It is the must have tool for troubleshoot strange problems at startup. It can decrease the size of your registry and memory by removing deleted records from registry files.